A portable unit called the Biobattery may allow companies and small Alberta communities to produce their own power, heat and bioproducts from municipal solid waste and other biomass feedstocks. 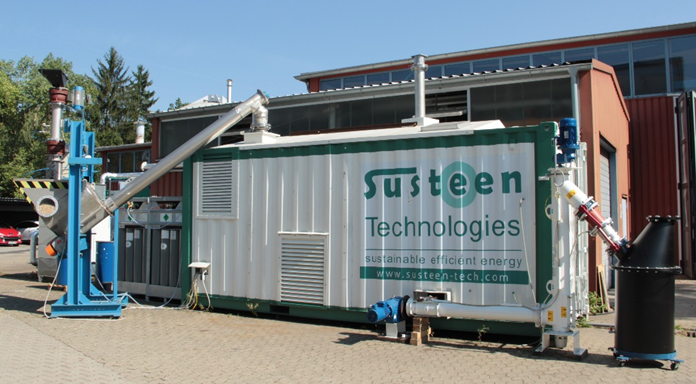 The technology, invented in Germany at one of the renowned Fraunhofer institutes, can transform biomass such as agriculture and forest residues into syngas, bio-based oil and biochar. Alberta Innovates contributed $300,000 from its Alberta Bio Future program to a multi-partner project to bring the Biobattery technology to Alberta. A demonstration unit will arrive to be tested under Alberta climate conditions, with a variety of Alberta feedstocks. The other partners investing in the project are the Alberta Ministry of Economic Development and Trade, Fraunhofer UMSICHT Institute, University of Alberta (Future Energy Systems initiative) and WestJet. The Biobattery uses Thermo-Catalytic Reforming (TCR®) technology – a system that combines an advanced form of pyrolysis with a second-stage process. Bio-oil produced with this novel technology has higher-value properties compared to conventional pyrolysis. These properties are a key factor in the overall feasibility and economics of using biomass-based feedstocks for conversion to fuels and chemicals. The technology is being commercialized and marketed in Canada by a spinoff Fraunhofer company based in Calgary, called Susteen Technologies Canada. Can be done at a smaller scale. Has the potential to process a range of biomass feedstocks. Alberta companies or smaller, remote communities could use biomass available in their areas and process the feedstock in the Biobattery unit. They could then use or sell value-added bioproducts to refiners for production of bio-based jet fuel, diesel or gasoline. The biochar could be used as a fuel source or sold to enrich soil. But the Biobattery needs to be tested under Alberta conditions, noted Dr. Christine Murray, Alberta Innovates Director of Agricultural Technologies. “We have to see it operate in the Alberta climate and using our feedstocks, to be able to effectively evaluate its operation and de-risk any future deployment in our remote and small communities,” Murray said.